The Town of Deep River is proud of the diverse range of recreational services available to our community. Citizens are encouraged to participate and take advantage of the opportunities available to learn new skills and to make new friends. If we currently do not offer a program that you would like to participate in, please feel free to contact us and we will work towards implementing it. We wish you a very healthy season and invite you to enjoy the benefits of participating in our community services. Please note that our Refund policy and Recreation Rates have recently changed. Please click the links for details. Please click the link to be redirected. North Renfrew Family Services acts as the Deep River chapter to deliver Canadian Tire Jumpstart® in our community. 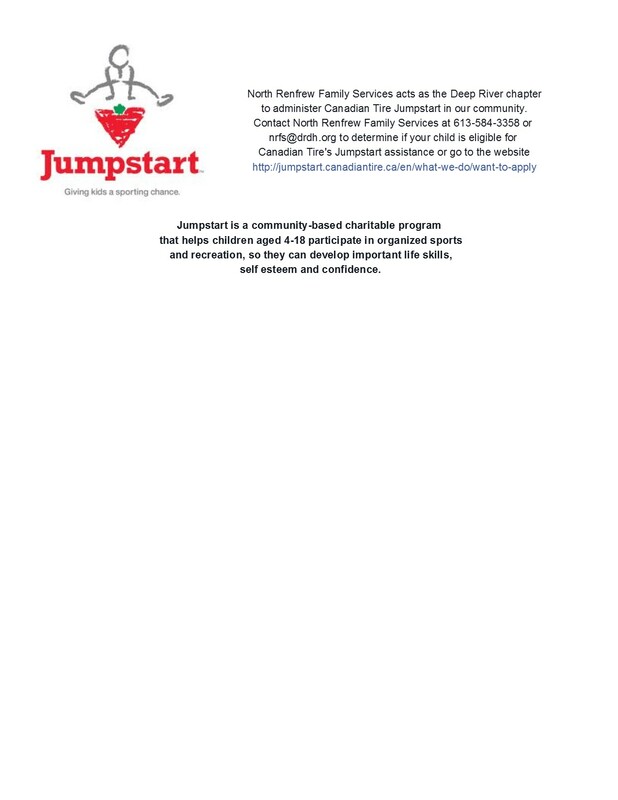 Jumpstart is a community-based charitable program that helps children aged 4-18 participate in organized sports and recreation, so they can develop important life skills, self esteem and confidence.